Longmont, Colorado is a historic town just northwest of Denver where I had the pleasure of spending a few days last month. Upon arriving, I checked into the Thompson House Inn and my accommodations were exactly what you would expect from a charming bed and breakfast. It was comfortable, quaint and personable and even included afternoon tea. Longmont is home to many excellent and well-known and varied restaurants around town, including Mike O’Shay’s, Lucile’s Cajun Cuisine, Jefe’s Tacos and Tequila. Two others, The Roost and Samples, were featured on the television show “Diners, Drive-Ins and Dives”. But I have to give a shout out to Cheese Importers. This restaurant is housed in a building that has had many lives. Starting as the first power station to service city residents and most recently a storage facility for the City of Longmont Museum. Now, it’s a successful cheese importer and bistro that is well known to both residents and visitors of Longmont. The city also offers public art, including a self-guided Art in Public Places tour that you can see on a bicycle through Zagster Bike Share. Downtown Longmont 2nd Friday featuring gallery openings and other activities sponsored by the Downtown Longmont Creative District. I also enjoyed Rosalee’s Pizza, which adapted an old world, east coast style of making pizza with a thin chewy crust. Coming from someone who has eaten a lot of east coast pizza, Rosalee’s Pizza held its own! On Saturday morning I visited the Longmont Farmers Market, which began in 1989, and is held at the Boulder County Fairgrounds. I grew up going to farmer’s markets and wholly appreciate that this market is producer-only, where the farmers only sell what they grow. Their season lasts from April - November. I enjoyed hearing local live music while walking through the market, sampling produce and seeing what crops were grown in the area. Lunch on this day was at The Dickens Tavern, located downstairs from the Dickens Opera House. This upscale restaurant offered a menu of American gourmet comfort food in a 19th century setting. Longmont is known for its craft breweries and after lunch, I jumped on the Brewhop Trolley, a really fun tour around town, where I sampled the local offerings of St. Vrain Cidery, GrossenBart Brewery and Wibby Brewing. So much beer and so little time…Cheers! My evening continued with a shuttle to Nitro Fest, held at the well-known Left Hand Brewery. Nitro Fest is a beer festival with regional, national and international breweries showcasing their “nitro” products. I didn’t think I liked dark beer, but then after trying an exceptional Milk Nitro Stout, I was a convert. This year the featured music were the bands MarchFourth and BIG Something. The festival was also visually entertaining with many people dressed in costume, because it was a “Voodoo Masquerade Formal” themed event. Nitro Fest was a great night filled with live music, macabre performances and delicious beer and one that I highly recommend attending. On Sunday morning I woke up to a picture perfect Colorado snowfall and enjoyed a Bluegrass Brunch at Oskar Blues. This local restaurant is known for it’s excellent beer and, in fact, was the first craft brewery in the United States to start canning their own beer. Dale’s Pale Ale, first canned in 2002 started the craft beer-in-a-can craze. The menu featured southern breakfast specialties such as Chicken and Waffles, Biscuits and Gravy and Chicken Fried Steak. There was even a make your own Bloody Mary and Mimosa Bar and local musicians brought their own instruments for an impromptu blues session. Brunch at Oskar Blues was a great way to start a Sunday! On Sunday afternoon, I attended a cheese-making workshop at The Art of Cheese. As a cheese lover, it was very satisfying to learn how to make my own ricotta and mozzarella at home. Simple recipes, including the correct milk to use, had us creating and stretching the curd in no time. Stuffing the mozzarella with fresh ricotta created my absolute favorite cheese, burrata. Served with a glass of red wine, I was in cheese nirvana. A Caesar Salad and Farmhouse Burger at Samples finished my day on a delicious note. Samples is a restaurant that serves amazing comfort food and has over 30 rotating craft beers on tap. It also has an awesome mission to provide employment for adults with disabilities through their Sample Supports program. Although I was only in Longmont for three days, my itinerary was full, and this brief but wonderful stay has me wanting to return and explore the city some more. The highlight of the trip was discovering Longmont itself and what the town, founded in 1871, had to offer. What I found was a city of historic architecture, art and culture, an amazing selection of beer, excellent restaurants fun outdoor activities and very friendly people. Longmont is an awesome city in the incredibly beautiful state of Colorado and definitely worth a visit! Have you ever heard of the Halo skin laser treatment? This is a skin rejuvenation laser that’s both non-invasive and has little to no downtime. 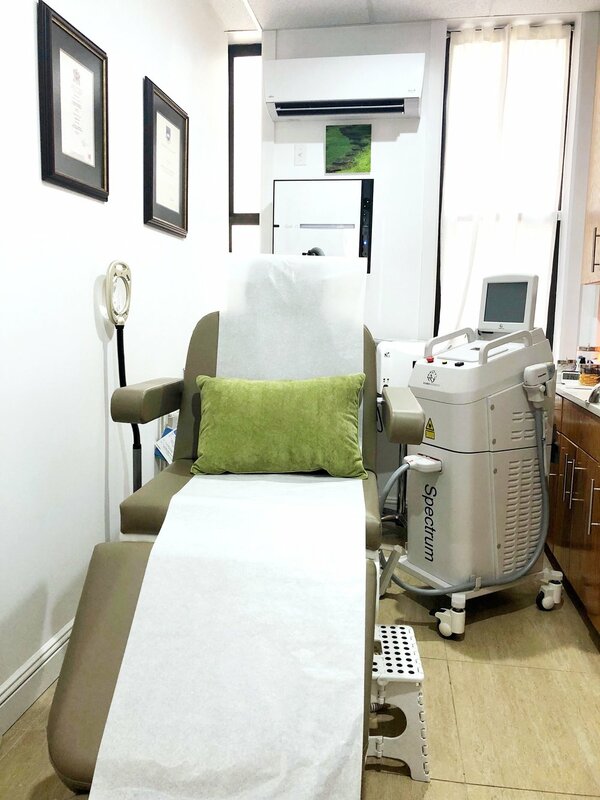 As described on the New Look New Life website, this laser “uses a dual wavelength process that also includes a cooling system to ensure complete comfort through out the treatment”. This machine helps to fix multiple skin issues such as sunspots, sun damage and my personal issue of acne scars. To minimize discomfort during this procedure, I was offered Ibuprofen and numbing cream. Dr. Elena Vega, a cosmetic surgeon, performed the procedure. She divided my face into four quadrants and guided the laser over each for approximately fifteen minutes. The entire treatment took about one hour. Post treatment, I was given an ice pack and an aloe vera mask. Although everyone’s skin reacts differently to this laser, my skin became very red. However, a few days later, the treated skin began to flake, revealing a smoother texture and an overall healthier appearance. The happy ending was that my acne scars were dramatically diminished. I encourage you to go to visit New Look New Life and consult with Dr. Elena Vega and her team regarding your own skin issues. Every good kitchen deserves a sharp knife and every serious cook knows that good knives are an investment. They're also useful, practical and pretty much necessary for daily cooking. Not only that, because they require greater pressure when slicing, dull knives are dangerous and cause more kitchen accidents than sharp ones. To keep my knives at their cutting best, I use the sharpener from Work Sharp Culinary, a “made in America” product from Oregon. As an added benefit, Work Sharp Culinary believes in environmental sustainability and respects the resources it uses. After reducing and reusing, the company recycles as much of their waste as possible including corrugated, glass, aluminum, steel, other metals, and plastics. The Work Sharp Culinary E5 electric kitchen knife sharpener uses both a control speed and a high-performance sharpening belt to make the whole process both simple and user friendly. The 8" ceramic honing rod guides the knife through the belt allowing a consistent edge. The one-touch programing built into the machine makes it easy for me to shape, sharpen and refine my knives at any time with the push of a button. I actually enjoy cooking now that I have good tools, starting with sharp knives. The simple act of slicing a tomato is effortless now and my knife glides through a sirloin steak. So any way you slice it, Work Sharp Culinary makes an excellent product that is America-made by an environmentally responsible company. Nothing dicey about that! After some research in my ongoing quest to reduce old acne scars, I recently decided to try a Lutronic LaseMD resurfacing treatment. I went to see Dr. Daniel Belkin at Laser & Skin Surgery Center of New York. The LaseMD treatment is designed to correct old pigment and acne scars and is safe on all skin types. Each treatment can be customized from 6-20 minutes depending on the patient’s skin issues and its recommend to have at least three treatments to see good results. As a pre-treatment, Dr. Belkin applied a numbing cream on my entire face, removing it after 20 minutes. The Lutronic laser is designed to roll across the skin and poke microscopic holes or channels, creating new passage ways to resurface the skin. During consultation, Dr. Belkin suggested five passes with the laser and fortunately the numbing cream on my face continued to work! Afterwards, my skin looked really red, like a bad sunburn. To calm the skin, a serum was first applied to the area followed by a sheet mask to deliver deeper results. I’m happy with how my skin responded to the Lutronic LaseMD treatment and would recommend a consultation with Dr. Belkin if you're looking for a quick, light resurfacing treatment at an affordable price. Recently, I had some great organic Hiball Energy drinks. Based in San Fransisco, Hiball is a good, healthy alternative to your regular energy drink and each one comes with zero calories, zero sugar and are non-gmo. Hi-Ball founder Todd Berardi was working as an investment banker when he first came up with the idea for Hiball. He liked drinking another high caffeine beverage, however, he didn't enjoy the crash that came with it immediately afterwards. To help counter-act this effect, he then came up with the idea to add sparkling water to a high energy drink and a new product was made. All the flavors I had were delicious and none of them tasted overly sugary or too sweet. Hiball is carried at your local Whole Foods and check their website to see other locations. Theres something special about receiving packages. I love the excitement of ordering something and waiting for it to arrive to my apartment or unexceptionally receiving something you didn't know was coming in the first place. I've recently partnered with Bestowe Gifting, an online gifting resource for those who want buy and send gifts or to hire to design custom gifts for special events. Bestowe prides themselves on high quality and well designed artisan small-batch goods. Some of the items included in these boxes includes: housewarming gifts, kitchen wares, self care bath products, men’s gifts, give for baby showers and bridesmaids and groomsman. I had a great experience working with Bestowe. We partnered to come up with a box that felt right to my brand and a gift that would suit any groomsman, man of fine taste, father or friend. Bestowe did a great job sourcing and curating items and were really easy to work with. The box we've partnered on with Bestowe, most appropriately called, The Tie Guy. It features your choice of 6 different ties, a leather and brass keychain and a delicious bar of Whiskey chocolate. I will definitely be using the service to ship out future gifts to my family and friends. And if you'd like to as well, they are offering a 20% discount for my readers through the end of August 2018. Just type in Tie20 at check out https://bestowegifting.com/ and you're set. Dental health is more important than you realize. Poor dental hygiene can lead to many physical problems such as bad breath and gum disease and more seriously, cardiovascular disease, dementia, diabetes and respiratory infections, among others. Recently, to help prevent some of these issues, and because I was overdue for a cleaning, I went to LuxDen located in Sheepshead Bay, Brooklyn for a dental appointment. This dental practice of Dr. Umanoff has excellent reviews and their office is spacious and state of the art. He treats each one of his patients with the utmost kindness and respect. Everything this office does is for the patients convenience, comfort and well being. As a new patient, I was given a tour of what they can offer patients including an amazing 3D printer which only a select few offices in NYC currently have. The hygienist started with a digital mapping of my teeth followed by a thorough cleaning and polishing and finally, x-rays. Although I’m very diligent in my dental hygiene, I was relieved and happy that I had no cavities. Dr. Umanoff conferred with the hygienist, reviewed my x-rays and had me put on safety goggles while he used a UV light to check for oral cancer. This was a pain free experience and one that I’ll gladly do annually as a way to prevent more serious problems. I would highly recommend this office for any of your dental needs. Many thanks Dr. Umanoff and Lux Den! Those of you who read my blog on a regular basis may know that I’ve been working on reducing the acne scars on face. Recently, I revisited Dr. Bradley S. Bloom MD at Skin and Lasers New York. Dr. Bloom is a board-certified dermatologist whose expertise is in laser treatments, Mohs micrographic surgery and cosmetic dermatology. The Excel V Laser treatment that Dr. Bloom chose for me is effective on all skin types. It uses a high-powered light with targeted pulses to repair skin conditions, including sunspots, rosacea, spider veins and acne scars. After just one treatment, I saw a noticeable difference in my skin. It not only looked more clear and bright afterwards, but the acne scars were smoother, too. This treatment took about 10 minutes there was no downtime and I scheduled a follow up appointment in August. We are lucky to have this technology available and you too, can achieve good results! Noticeable difference in my skin. It not only looked more clear and bright afterwards, but the acne scars were smoother, too. This treatment took about 10 minutes and there was no downtime. If you’re having similar skin problems, there’s an answer out there. Do a little research on the Excel V Laser or visit a dermatologist for a skin consultation. You can too achieve good results! It might be TMI, but the excess hair on my back causes breakouts. So, to treat both problems at once, I recently had a laser hair removal service at Koru Wellness Aesthetics. Dr. Vivian Chin was very attentive to my concerns and she often uses a combination of treatments to provide her patients with the best results. To begin my treatment, Dr. Chin shaved my back and shoulder areas and applied a gel to the entire area. Then, she rolled a Rohrer Aesthetics laser across the four quadrants of my back. The laser was set to an 810-DIODE, which features a larger spot laser area combined with a built-in cooling system. The treatment took approximately 45 minutes and, unlike other laser treatments in the past, this one was completely painless. After the treatment was finished, a repair balm was applied to the skin. And although it was temporarily red, my skin felt much smoother. Dr. Chin told me that in the following weeks I might see ingrown hairs show up on my back but so far I haven’t seen any. Koru offers a variety of other laser and skin services and I’m confident that you will be as pleased with your results as I am. She offers both online appointment booking to make your scheduling easy and complimentary consultations. Thank you Dr. Chin and Koru Wellness Aesthetics! Since I had already planned a trip to St. Helena, California, I took it upon myself to contact Health Spa Napa Valley on Main Street in St. Helena. Ashley Darling, the Marketing Director graciously offered two complimentary treatments that I gladly accepted. On a rainy chilly March day, I walked through the doors of the spa and entered a serene and inviting space. I was warmly greeted and offered citrus infused water. My first treatment was a 50-minute performance massage with Michelle. This was both healing and rejuvenating. Since I spend a good part of my day networking on my cell phone and because of the tension in my neck the masseuse recommended ear pods to alleviate the stress of holding my phone up to my ear for many hours during the day. She also suggested that I detox for the rest of the day by drinking water and staying away from caffeine and alcohol, which is hard to do in wine country! My next treatment was an 80-minute gentleman’s facial with Toni that included cleansing, toning, two exfoliating Eminence masks and a peel. This was followed by two Vitamin C serums, a moisturizer and sunscreen. The beauty of scheduling a service at Health Spa Napa Valley is that it also provides amazing amenities. These include, a hot tub, outdoor pool, fitness center and sauna. I also went home with a bag of complimentary skin care products. I can’t recommend this spa highly enough, its definitely one of the better ones I’ve been to in any city. Thank you Health Spa Napa Valley! Although it’s not often talked about, tongue health is much more important than you think. Doctors and dentists routinely check the tongue as it gives clues to issues going on in the mouth and body. Because tongues aren't smooth, bacteria, if not properly removed, can hide in the crevices and grow between the taste buds. Rinsing the mouth with water after brushing or using mouthwash doesn't solve the problem either. When rinsing, only the superficial bacteria are destroyed, while the bacteria below the surface continue to thrive. So, here’s a solution. Recently, I've been using a TUNG Brush and Tongue Cleaning System. The TUNG brush was specifically designed by a dentist for tongue cleaning. The bristles on this tool work through the crevices and around the taste buds reducing bacteria on the tongue. The tool is easy to handle and fits comfortably in your hand. Used with a mint gel, my mouth feels refreshed after each daily use. And TUNG products are designed and made in America. So, it’s time to get behind a good product and start taking care of your mouth while the new year is still young! Talking about it should be “right on the tip of your tongue”. Happy brushing! Joggers; the laziest approach to wearing a pair of pants. Popular among the sneaker head community, these pants were designed to highlight the shoe the person is wearing. Besides jeans, these pants clinch at the person’s ankles. This trend started in 2011 by Ronnie Fieg, owner and founder of the street style focused shop KITH located in SOHO NYC. He created this style by experimenting with a pair of camo pants that didn’t fit him properly. Once he altered them and put an elastic cuff on the bottom, a trend was born. Dressing more casually should never been taken with a lazy approach. I believe that you can be just as comfortable wearing a pair of jeans compared to wearing joggers. Joggers are nearly impossible to dress up. With something so ill fitting and relaxed to begin with, you automatically look poorly dressed. Lastly, dressing exactly the same way as everyone else isn’t inspiring. Menswear should be more focused on classic, staple pieces that have been in existence since my grandparent’s generation. I wish this trend will end and I will never support it.